This summer, I've been really curbing my urge to spend. Total. Mind. Control. I went out west for over a month and didn't buy anything memorable for myself. So to reward myself, I did a bit of shopping. 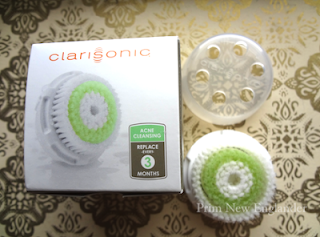 I've been using the Clarisonic Plus since last June and it is definitely my HG exfoliation product! I usually use the sensitive brush head, but I saw the Clarisonic Replacement Brush Head Acne Twin-Pack and had to try it! I've been eyeing MUFE's Mat Velvet+ since October '11. And I've been itching to try it after MakeupByTiffanyD's rave in her April Spring/Summer Foundation routine. Anyway... At the store, I really liked the way the foundation looked. So I bit the bullet and bought it! For reference, I'm a NC35 in MAC Studio Fix Fluid (although it's not perfectly matched to my skin- it's too pink!) and I was matched to #35 Vanilla.